1300 - end of prod. 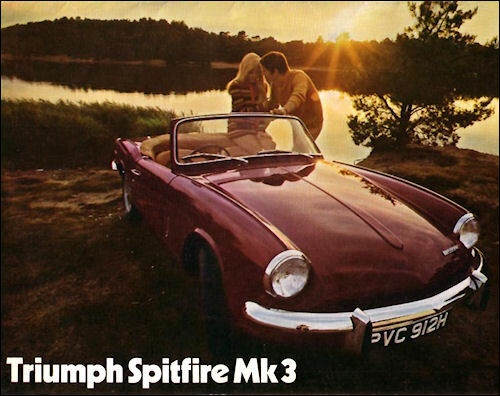 Spitfire Mk 3 - end of prod. GT6 Mk 2 - end of prod. 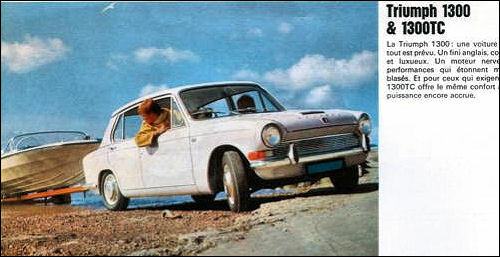 Most powerful and developed of the Herald series, first introduced in 1959 as a one-litre model, the 13/60 has a 1,296 c.c. four-cylinder engine mounted in a separate chassis. With the one-piece lift-up front end, plus the separate chassis, the Herald's engine accessibility is unparalleled. Suspension is independent all-round, and the good-sized luggage boot also contains a reserve tap for the seven-gallon fuel tank - a rare luxury in this day and age. 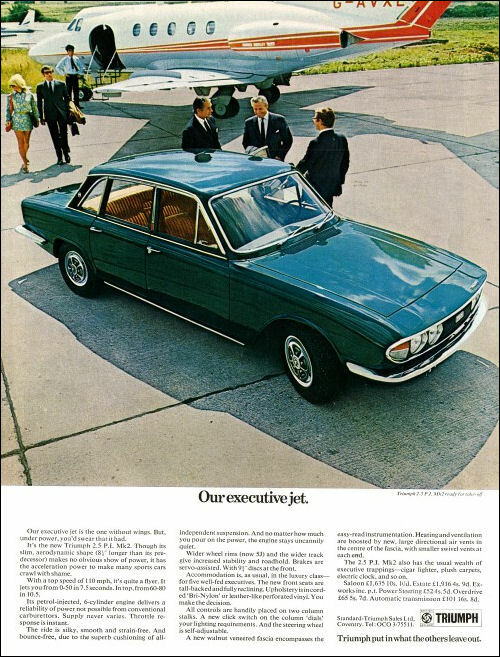 The Herald is a close-coupled four-seater with good internal trim. 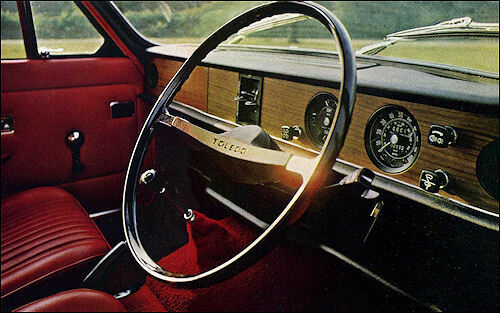 There is a collapsible safety steering column. 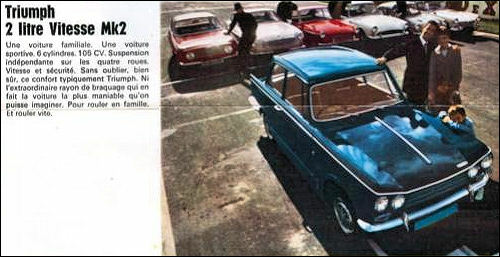 This popular close-coupled four-seater is almost unique in that it supplies space for a family and their luggage -and has a powerful and smooth six-cylinder engine. 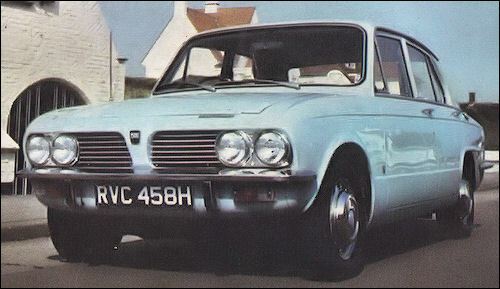 Based on the Herald saloon from the same manufacturer, the Vitesse has identical bodywork, but four-headlamp treatment in the lift-up bonnet. There is a separate chassis frame and all-round independent suspension, and a top speed of more than 100 m.p.h. 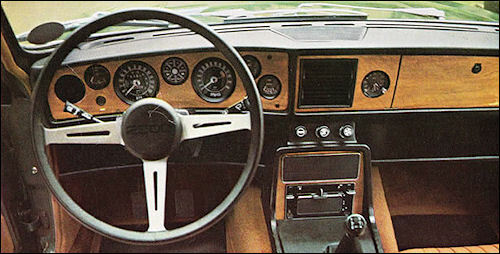 In spite of its realistic price the Vitesse has polished wood, thick carpets and deep seats as standard equipment. 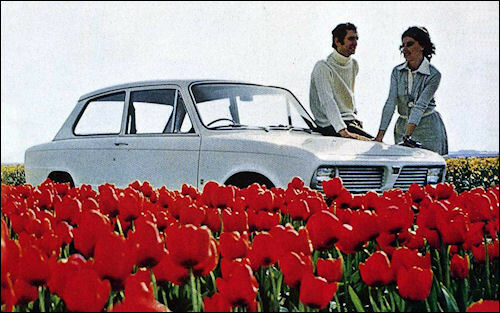 1300 (R4 cyl, 1296 cc, 61 bhp) - end of prod. 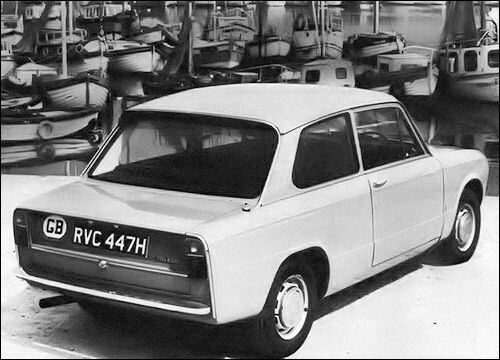 1300 TC (R4 cyl, 1296 cc, 75 bhp) - end of prod. Triumph's six-cylinder 2000 was updated last year with wider track, restyled front-end, extended boot, wider wheels, and many other improvements including new facia, switchgear, and seats. 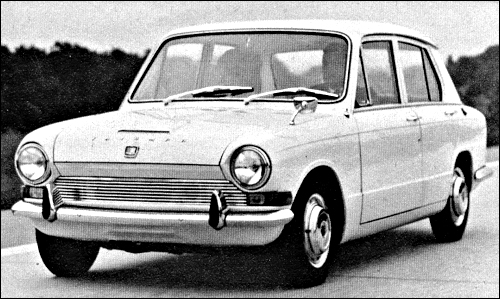 The adoption of a new cylinder head (with raised compression ratio) lifted power-output, and the adoption of an alternator in place of a dynamo meant that the battery would be not taxed in supplying the many electrical demands. The new tall-backed reclining seats are offered with the option of woven nylon-cloth contact sections or embossed PVC. The nylon seats set new standards of comfort. Besides offering classy good looks and comfort in the same category, this is a car for the enthusiast. With Lucas fuel-injection (PI stands for petrol injection) there is 132 (net) horsepower under the (lowered) bonnet, and the 'PI' can nip up to 110 m.p.h. It will cruise all day at 100 m.p.h. 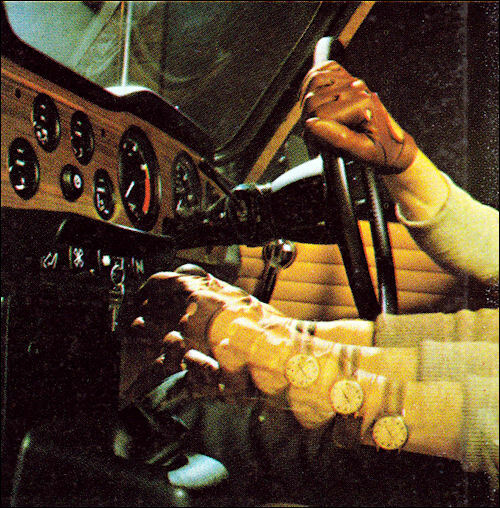 on the Continental motorway system and the engine exhibits unusual smoothness. 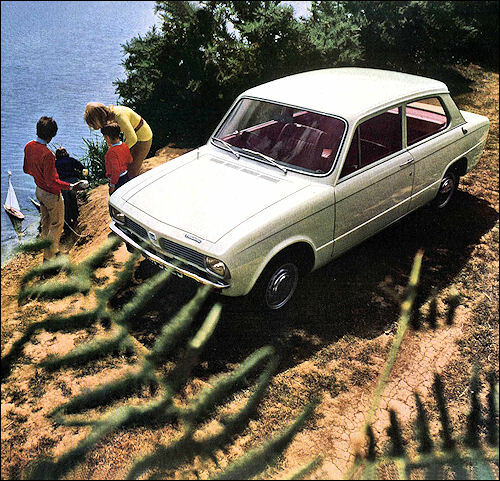 Acceleration is without a flat-spot, and although it has a roomy, richly-equipped four-door body, the 0-50 m.p.h. acceleration takes but 7½ seconds. Top gear acceleration is exceptional for a 2½-litre. Mk 3 (R4 cyl, 1296 cc, 75 bhp) - end of prod. 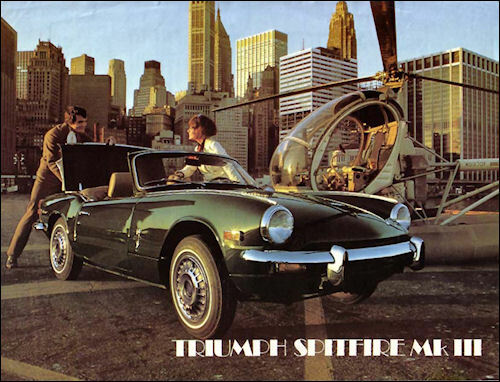 No changes to the popular Coventry two-seater sports at the Motor Show, but the all-independently-sprung Spitfire is still one of the world's most sought-after open cars. 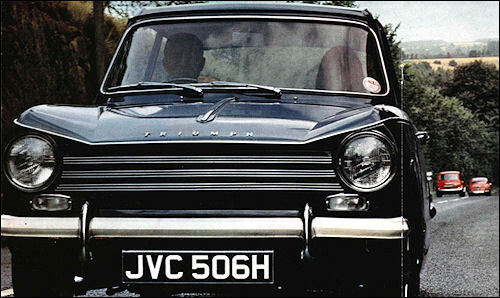 Most of the car has been derived from the Triumph Herald, including the separate chassis, four-cylinder pushrod o.h.v. engine, and four-speed all-synchromesh gearbox. 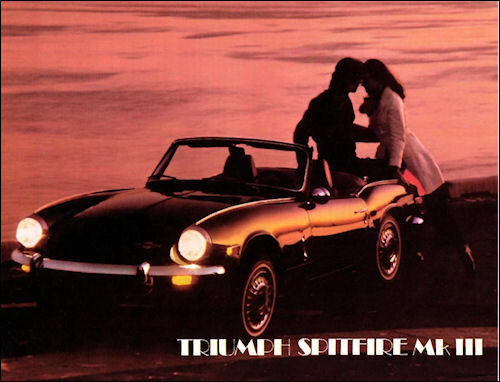 It is one of the few sports cars which has seat adjustment enough for a really tall driver. 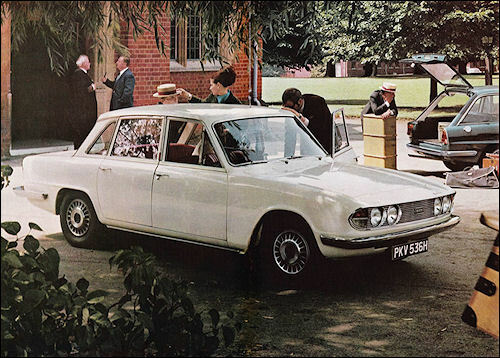 Unusual for a 1300 c.c, sports car, it can also be supplied with an overdrive, and there are available hardtops which convert it into a snug coupé. Mk 2 (R6 cyl, 1998 cc, 104 bhp) - end of prod. 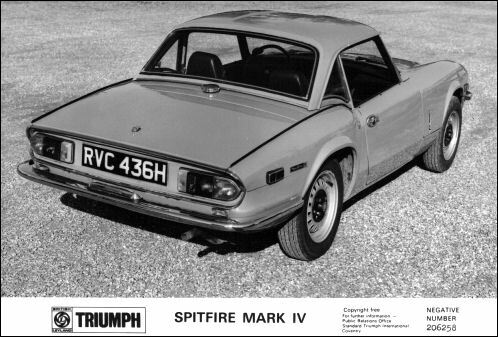 Based on the team of special Spitfires that raced at Le Mans a few years ago, the GT6 utilises the same closed coupe bodywork and chassis but is powered by the peppy two-litre six-cylinder in-line engine of the Triumph 2000 saloon. 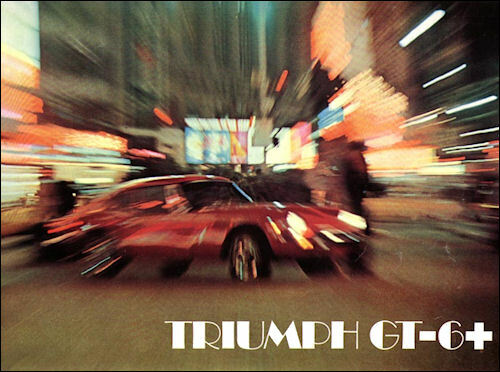 This remarkably good-looking GT6 is capable of 110 m.p.h. and has a great deal of luggage accommodation behind the two seats. 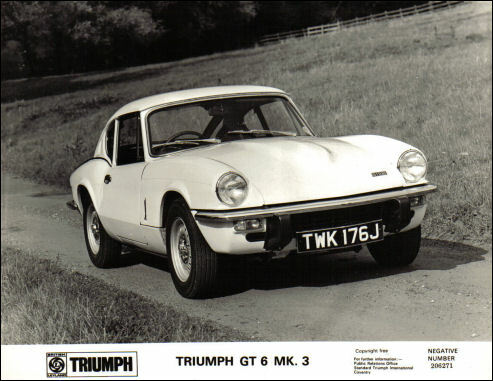 Unlike the current Spitfire, the GT6 uses a wishbone rear suspension, but both systems are independent. 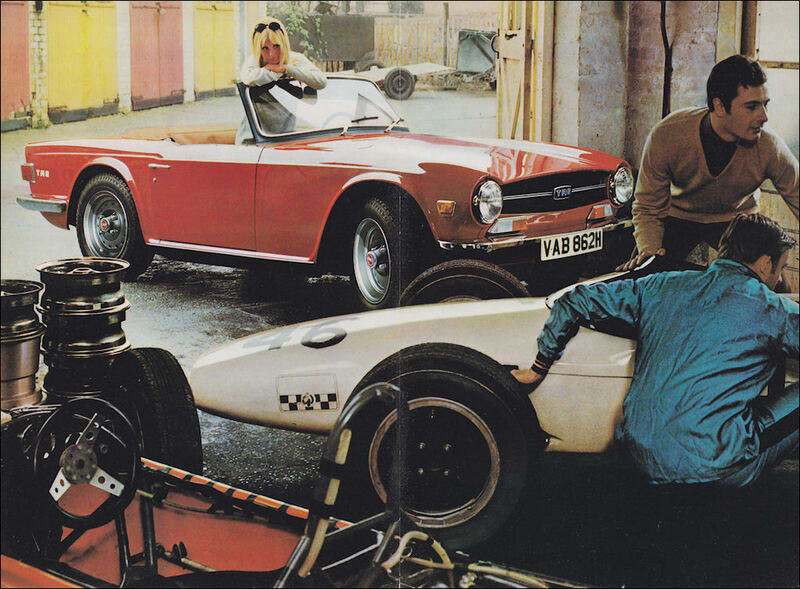 The entire front-end lifts-up for easily getatable servicing, an advantage that started with the Triumph Herald. 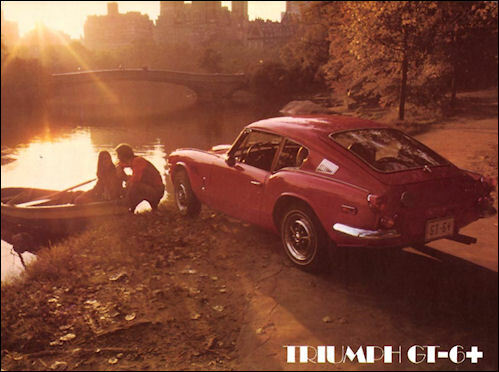 Latest of a long line of highly successful Triumph TR sports cars which started in 1952 with the Vanguard-engined TR2. 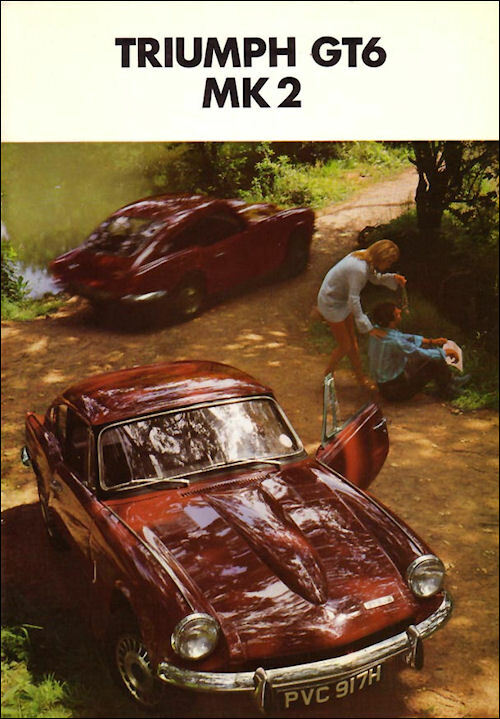 Restyled in 1969 by the German-Italian Karmann-Ghia alliance. 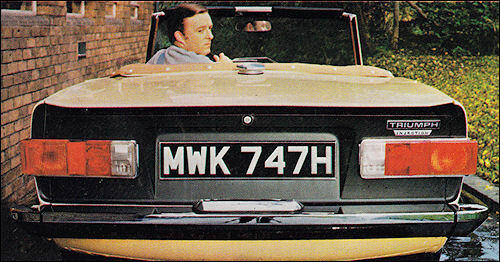 the new shape featured an aggressive front-end, and a chopped tail which provided increased luggage space. 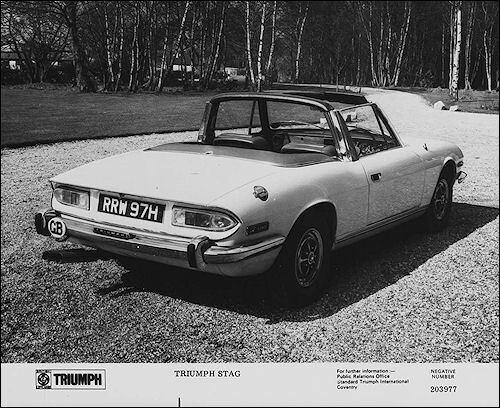 The heart of the TR6 however is the 2.5-litre in-line six-cylinder engine, virtually identical to the 2,5 PI saloon unit. Both have Lucas petrol-injection but the two-seater sports car has a bonus of some ten horsepower due to its higher tune. 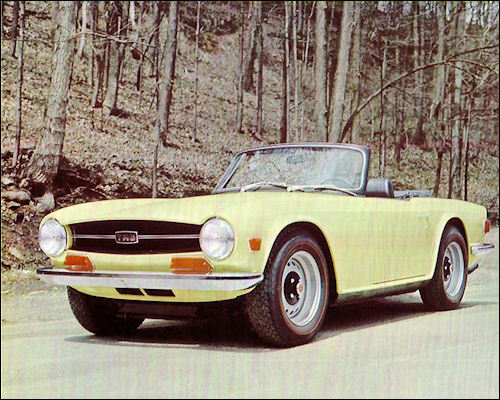 The TR6 has all-independent suspension. 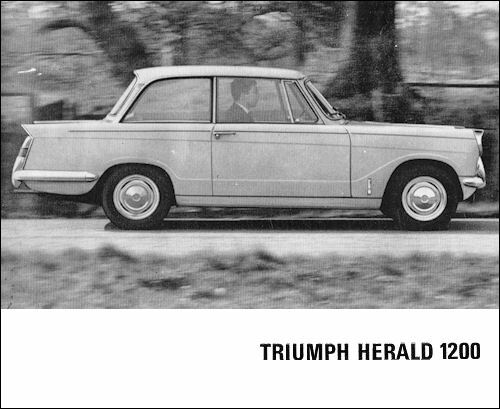 Front wheel drive is retained on this new four-door Triumph which succeeds the 1300, and has an enlarged version of the four-cylinder o.h.v. engine. By increasing the stroke by 11½ mm. the engine has been enlarged to 1493 c.c. and power is up to 61 b.h.p. Torque is increased significantly, and a 0-50 m.p.h. 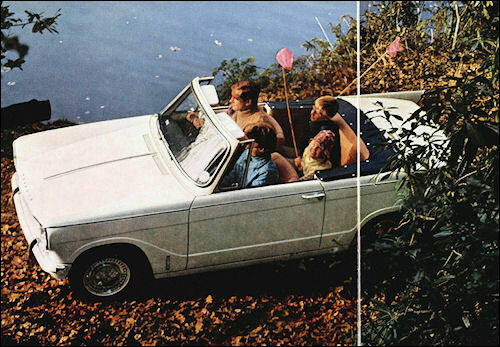 from standstill is possible in 12½ seconds. 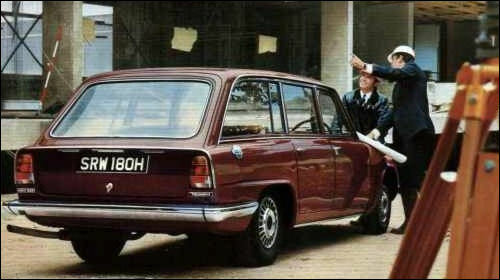 The unitary body of the old 1300 has been lenghtened seven inches and has been instrumental in not only adding grace to the car's lines but increasing the luggage boot capacity to 13¼ cubic feet. 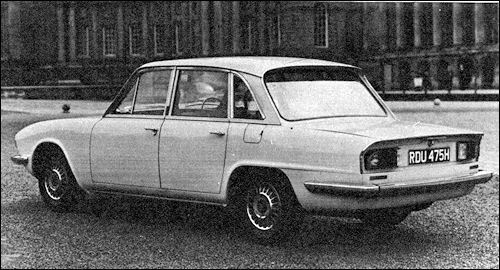 Latest saloon model from the Liverpool factory, and aimed at the popular market, the Toledo utilises the main elements of the now discontinued 1300's unitary body, but with two doors. 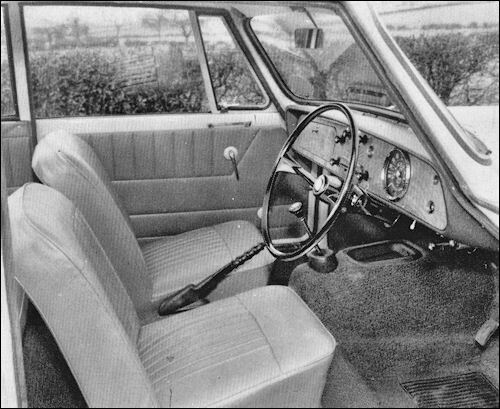 Instead of front wheel drive however, the neat 58 b.h.p. 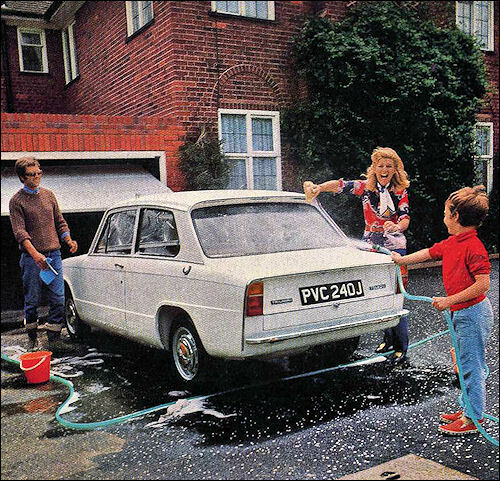 saloon has rear-drive and a live axle. Toledo retains the same length and width of the old front-drive 1300 but the new grille and front-end treatment does in fact add 1 1⁄8in. 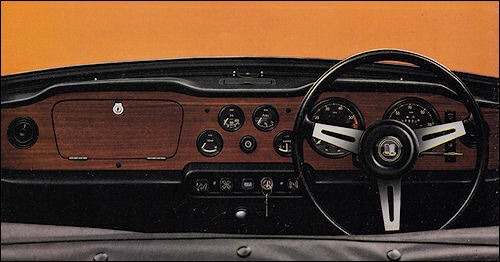 In the Triumph manner the interior is well-trimmed, and the facia is covered in matt walnut veneer. Top speed is around 85 m.p.h., and third is good for 60. 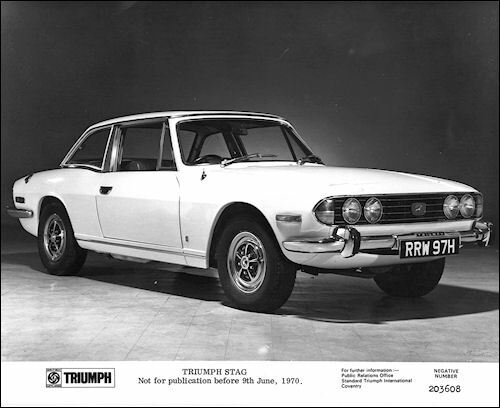 New sporting car from a manufacturer well-versed in the production of such cars, the 2+2 Stag is powered by a turbine-smooth overhead camshaft V8 of three litres. With its 145 b.h.p. and tremendous torque, it is capable of almost 120 m.p.h. but has amazing flexibility as well. 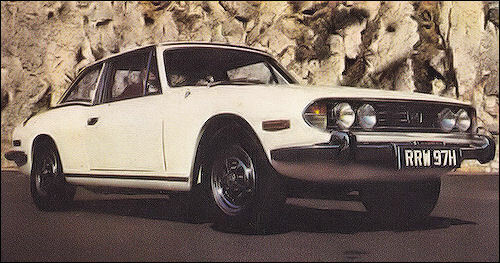 The basic Stag is an open car with soft-top, but a detachable hard-top converts it quickly into a snug coupe. The built-in padded roll-bar not only provides security in an accident, but also extra rigidity for the unitary construction. 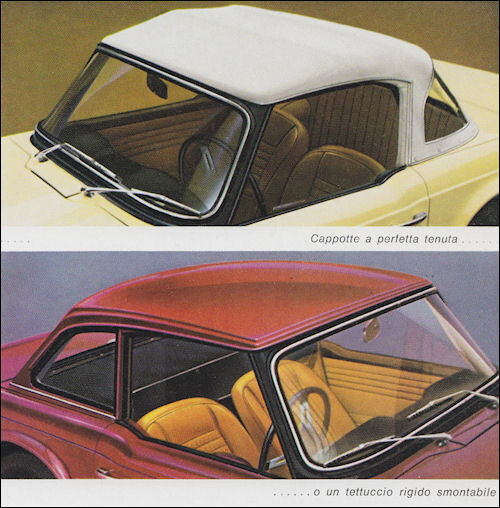 The furled hood can be stowed, even when the hard-top is fitted.